Just a quick post since I just had to clean this damn software off a computer. 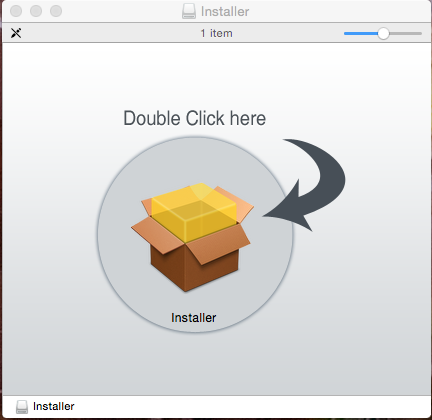 It’s Genieo/MacInstaller. On the computer it was on, it kept downloading, and mounting a DMG with an Installer on it saying “Double click here” (see picture). No, that doesn’t seem sketchy. The best info on uninstalling it I’ve seen is here. Obviously, if you don’t know what you’re doing, I wouldn’t suggest blindly following these instructions, but I don’t see anything that could go horribly wrong from any of this. Just make sure you’re deleting what it says to delete, and not something else… Mac’s are pretty resilient, but if you delete some things, it will cause issues. In case you do see this, it looks like the primary vector this is spread by is fake Adobe Flash Player installers. Never, ever, just click a link asking to install/download Flash Player, or Java, or anything like that. Go through the effort of Googling or typing the address of the actual vendor (Adobe, Oracle, etc), and download from there. If your Flash player downloads from “www.thisistotallylegit.com”, it’s probably not. Anyway, good luck, and death to Mac (and any other) Malware.